Since my boys have been asking for Amos Cookies, I thought may be I should try making it. This recipe was given by my ex-colleague from a cookbook, if I'm not wrong, should be Mrs Field's Cookbook. I tried baking once using my old oven and the result was not too bad. Here you go.... none other than the simplest and the most familiar Chocolate Chips Cookies. As I have some left over striped almond, I decided to add them in and unexpectedly the crunchy texture of the cookies went well with the almond. The cookies are so good that the guys in my family love it so much and you know what? It's so simple to make that I actually made another batch again the next day. 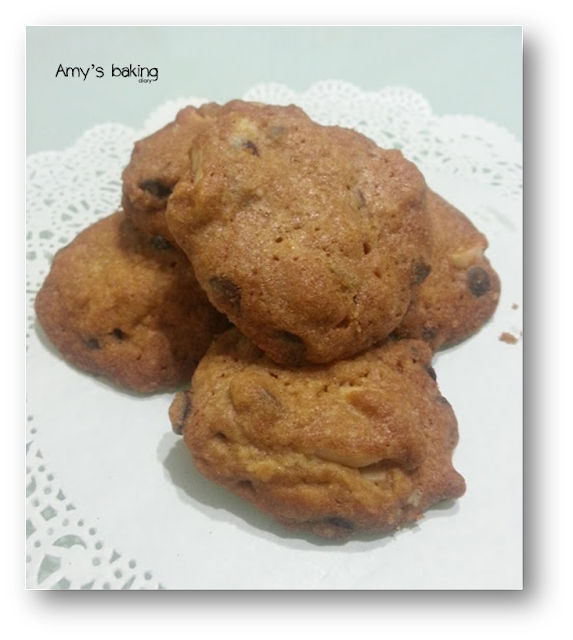 The cookies are very crunchy and a bit like Amos Cookies texture. I'd like to try out cookies that is crunchy and yet has chewy texture inside. I really enjoy baking with my new oven. There are so many must-do recipes in my list and I can't wait to try them all out. But I repeat each recipe at least 2 time, just to perfect it before moving to the next recipe. So it's going to take me a little while to complete the list. 3. In a large bowl with an electric mixer, cream the butter and sugars. Beat in the eggs and vanilla until just combined. 4. Add the flour mixture, striped almond and chocolate chips, then beat on low speed until just blended. 5. Drop the dough by rounded tablespoons, 2 inches apart onto an ungreased cookie sheet. Bake for 20 minutes, or until golden. Transfer to wire racks to cool.